We all scream for ice cream…especially when it’s a treat this unique! 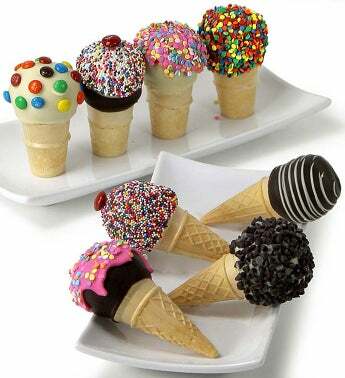 Each one of our delicious ice cream cake pops—half in vanilla, half in chocolate—are baked into sugar or wafer cones for a guaranteed gourmet delight. Hand-dipped in Belgian chocolate, decorated with a variety of yummy candies and individually wrapped, these pops are every drop as sweet as the real thing... without the drips!